Edinburgh City Secured their place in the SPFL with a convincing 2 goal victory over Annan who now have it all to do to secure a place in the play offs. It was a disappointing performance from Annan on a hard bumpy pitch and they now face the prospect of having to win next Saturday to ensure that they will make it to the play offs. To compound Annan’s misery they had the influential Darren Ramsay sent off in injury time which will make the player ineligible for the last two matches of the season. Both teams had opportunities to score in the first half before Derek Roirdan opened up the Annan defence with a through ball to Craig Beattie who guided the ball past Blair Currie in the 44th minute. The goal gave the home team the edge after they squandered a good opportunity to go ahead in the 19th minute when Derek Roirdan was put clean through but his final effort was directed straight into the arms of Blair Currie. Peter Weatherson responded for Annan minutes later when his near post header from a Nathan Flanagan corner pulled out an important save from Keeper Calum Antell who somehow clawed the ball out of the net. Craig Beattie set up Joshua Walker in the 28th minute but the shot did not match the build up going past the post. 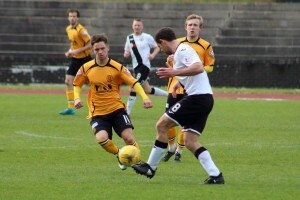 Aiden Smith set up Weatherson minutes later but the miss kick from 15 yards was another opportunity lost for Annan. The defining moment of the first half in the 44th minute was a moment Annan will want to forget, Annan lost the ball in the City half and Roirdan was quick to play a ball over the head of Bronsky into the path of Beattie who finished clinically guiding the ball past Currie and off the base of the post into the net. Annan had an opportunity in the 55th minute when Flanagan was fouled on the edge of the 18 yard box and Weatherson’s resultant free kick went narrowly past the post with Antell beaten. 2 minutes later and the home team doubled their lead, it was an unlucky goal for Annan to concede after Black’s header from a throw in fell perfectly on the edge of the box for Lewis Allen who’s low shot went through a ruck of players and into the net past the outstretched arm of keeper Currie. Weatherson’s long through ball into the path of Ramsay was thwarted on the edge of the box by keeper Antell. Annan faced an uphill battle but they still created good scoring opportunities with Black and Smith both squandering chances with headers from great positions. Annan’s miserable afternoon was completed deep into injury time when Darren Ramsay was sent off for a tackle along with Christopher McKee for the City. It was certainly a day when the positions at the top of the table became even more interesting with both Forfar and Arbroath still only separated by one point after both teams recorded 3 goal and 2- 1 victories over Clyde and Cowdenbeath respectively with both these teams locked in a battle with Berwick Rangers for the bottom position. Montrose maintained their excellent form with a 1-0 victory over Berwick, a result which thrusts Montrose into the play off positions for the first time this season. Elgin scored an injury time eqauliser to grab a point in the draw with Stirling Albion. Elgin have moved out of the play off places for the first time but they are still very much in the frame for a play off position with only 2 points separating Elgin, Montrose and Annan. Annan’s match next week at home to Montrose is massive for both teams as they strive for the play offs, victory would ensure Annan win a place in the play offs. ANNAN ATHLETIC : Blair Currie, Steven Black ,Steven Swinglehurst, Raffi Krissian, Steven Bronsky (Jean Guy Lucas 55 min), Gavin Skelton (Smart Osadolor 87 min), Rabin Omar, Darren Ramsay, Peter Weatherson, Aiden Smith , Nathan Flannigan (David McKenna 75 min). Substitute’s not used Alex Mitchell, Callum Home, Max Wright, Barry Cuddihy. REFEREE: Graham Beaton .​Assistants Dougie Potter and Jonathen Bell.